Balanced Stereo Sound for a wider area that makes it convenient for an outdoor speaker. These are award winning exterior speakers that are guaranteed to withstand harsh weather. Weather Resistant withstands rain, snow, salt and hot temperatures. Multi chambered to minimise audio distortion for a clear natural sound. Outside speakers that can only cover a few sweet spots, but not further then the garden, patio or pool. 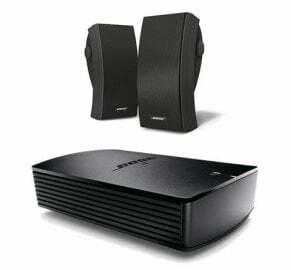 These environmental speakers the Bose 251 use an Articulated Array design to produce a wide sound field. At precise angles, you can experience consistent stereo effects as you move around outdoors. The unique multi-chambered design minimises audio distortion for clear, natural sound. Bring Lifestyle® system performance outdoors. By owning the Lifestyle System, by adding the 251 environmental speakers. The SA-3 amplifier package can bring the Lifestyle experience outdoors. Experience whats inside on the outside and bring your music to the outside world. With the Soundtouch SA-5 Amplifier which is optional. You can stream music more effortlessly. Just connect it up to a wireless connection and stream internet radio, music services or your own personal library. All available, setting a option for different music to be played inside or outside stream different music in different rooms or the same music in all the rooms.